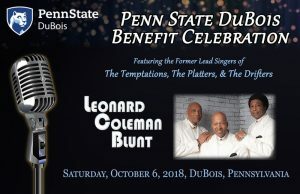 Mark your calendars as Leonard, Coleman and Blunt are headlining the Penn State DuBois Benefit Celebration to support Penn State DuBois on October 6, 2018, at the DuBois Country Club. They are the former lead singers of the Temptations, the Platters, and the Drifters. Glenn Leonard, Joe Coleman, and Joe Blunt grew up singing together in church and on street corners throughout the 1960’s before finding fame and fortune separately, then reuniting after 30 years to harmonize together once again. Glenn Leonard joined Motown’s legendary Temptations, recording ten hit albums, touring the world, and singing lead on many of their 1970’s and 1980’s R&B hits. Joe Coleman joined the Platters for a two-decade stint as the group’s lead singer in addition to gaining a successful career as a songwriter and playwright. Joe Blunt performed and recorded with the Drifters for over a decade in venues all over the world alongside Ben E. King and Johnny Moore, earning a Lifetime Achievement Award from Sony Records. A reception, dinner, drinks, and the LCB performance are all included in the ticket price of $100 for the evening, with $50 from each ticket sale being donated directly to Penn State DuBois scholarships funds. The reception begins at 6:00 pm, dinner will be served at 7:00 pm, and Alumni Award recipients will be recognized beginning at 7:30 pm. LCB will take the stage at 8:00 p.m.
PreviousPrevious post:LCB LIVE at The Carlyle Club in Alexandria, VA – September 7NextNext post:FREE Concert at the Oak Leaf Festival September 1!